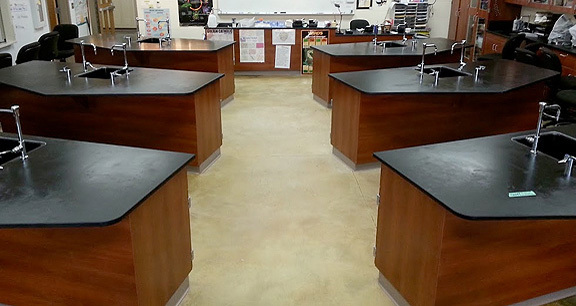 Project obstacles and solutions: Guerin Catholic High School was looking for a durable finished floor for their new art and science labs. The architects specified an acid stained concrete finish. The look supported the modern design of the new wing and was easy to maintain. But it also was able to save construction time in a tight schedule. The art and science wing had to be finished after the summer break began in early June and had to be ready for school to start in August. Visions in Hardscapes had three days to stain and finish 13,000 square feet of flooring before the cabinets were installed. The process involved using two different acid stain colors. They worked around the clock for 72 hours to keep the project on schedule. Acid staining is one of the more popular ways of coloring both existing and new concrete floors. For coloring options available through IMI, click here.